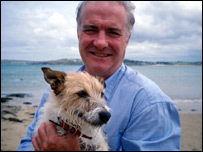 Celebrity Cornish chef Rick Stein's beloved dog has died, aged 17. 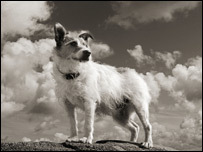 Chalky, the Jack Russell owned by fish chef Rick Stein, had become well-known through his appearances on Mr Stein's television series. The chef, along with his wife Jill, paid tribute to his dog. He said his Chalky - who died on 13 January - was loved by everyone. "It's a source of puzzlement to me that he never knew how famous he was," Mr Stein said. Stein said that Chalky had always been the family dog who was loved by his children, and was healthy right up until the last six months of his life. However, he showed a more mischievous streak if there were cameras about, the chef said. Stein said: "He got up to some mighty capers: Leaping to bite a microphone, snarling at our cameraman so fiercely that we thought twice about using the film, fearing his shocking fangs would frighten children. "He dispatched rats and caused consternation by doing the same with a rabbit or two. "He swam and jumped on boats, he attacked crabs, ran rings round Alsatians and Border Collies being much fiercer and never backing down, ever." Stein said also recalled that he hated the postman; and how once he scampered over a lawn owned by Prince Charles, leaving Rick worried that he might have a go at its owner. "He petrified me that he might bite the Prince of Wales but he didn't. "Most of all though, we knew him at home as rather an unassuming, diffident dog who was never greedy, pestered you a bit for walks but not too much and kept reasonably quiet."